NEW! 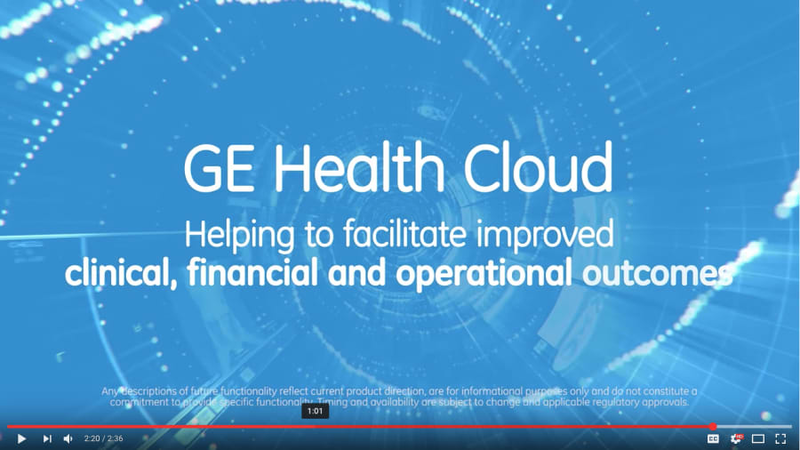 Watch the recording of our 1/24/17 webinar with GE Health Cloud chief product officer Anish Patankar. Short on time? You can also browse through a summary of the questions we answered. Full service cloud hosting environment enhanced with core services for Identity and Access Management, logging and auditing. Trusted, Secure and compliant platform certified for HIPAA, HITECH and HITRUST. Security lifecycle services and process enhanced through GE and technical partners. Access data from multiple data sources, including existing healthcare solutions, patient monitoring data inside and outside of hospitals, financial and operational systems. Connect to more than 500,000 GE medical imaging devices, with the potential to link to more than 1.5 million imaging machines worldwide. Market and sell apps to GE’s broad customer base from the enterprise app store in global markets.Leverage business operations services including billing, metering, usage reporting, invoicing and analytics to meet all business needs on a single platform. Work with GE Healthcare sales teams to identify joint opportunities and solution offerings. ¹Any descriptions of future functionality reflect current product direction, are for informational purposes only and do not constitute a commitment to provide specific functionality. Timing and availability are subject to change and applicable regulatory approvals. GE Healthcare is an $18 billion unit of General Electric Company (NYSE: GE), employing more than 52,000 people worldwide and serving healthcare professionals in more than 100 countries. Build something amazing. Leverage drchrono's free Healthcare API and access their EHR, practice management, and medical billing platform — built by developers, for developers. Visit www.drchrono.com/api and click on "Start Building" to create an account and set up your application. Hacking Health aims to transform healthcare by connecting healthcare professionals with designers, developers, innovators and entrepreneurs to build realistic, human-centric solutions to front-line healthcare problems. We believe that innovation is fuelled by diverse minds and perspectives. If you're based in New York, check out Hacking Health's skin health hackathon on March 10. The prizes include $25,000 in cash, partnerships, and co-working space. Sign up at skinhealthhackathon.splashthat.com.